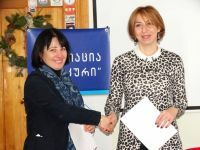 On February 8, Association "Merkuri" held a seminar "First Aid". The seminar was leaded by Ms. Tsitsino Shengelia. Representatives of NGOs from Samegrelo Region took part in the seminar. Participants received first aid pack: posters, firs aid kits, t-shirts and calendars.